their official end-of-life and becoming obsolete, leaving engineers with the challenge of managing obsolescence effectively. 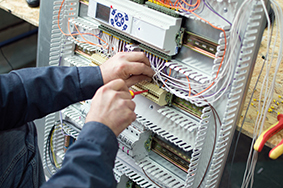 Here, we explain how industrial plant managers can manage obsolescence in control panels. The control panel is the backbone of the modern industrial plant. Whether a business is at the forefront of the Fourth Industrial Revolution or focused more on day-to-day production, automation is pivotal for modern industrial companies. Although these systems present plant managers with a wealth of benefits in the form of efficiency savings and improved effectiveness, their importance is beginning to pose a unique challenge for industrial businesses. Today, many plants still use the control panels installed several decades ago, which means they are now verging on obsolescence. Although businesses can partner with specialists to supply obsolete industrial components, a growing number of plant managers are realising that modernising systems is more beneficial and less risky in the long-term. However, this is rarely an easy task, as the control system is often responsible for controlling an important process that can significantly harm productivity if stopped. For example, it might be that a control system is responsible for managing a conveyor in a dairy production plant. Since dairy is a sensitive food item that must be handled carefully and promptly with full traceability, even a momentary pause in production can mean an entire line of product must be disposed of to ensure safety standards. So, how do you manage obsolescence in a critical control system? From JMartans’ experience as a systems integrator in Malta, it has found that the best approach is to complete an upgrade or replacement project in phases. By doing this, plants can minimise operational disruption. This could mean replacing the front end of a control system first, such as by modernising a SCADA system and ensuring it works with the obsolete components and equipment, before upgrading those individual obsolete parts. A systems integrator taking this phased approach can then avoid causing costly, unwanted downtime and ensure systems remain operational. The reason many industrial businesses continue using legacy equipment purchased decades ago is often due to the risk of planned downtime affecting performance. By working with an experienced automation systems integrator plant managers can get the best of both worlds: an effective, modern control panel without lost production.